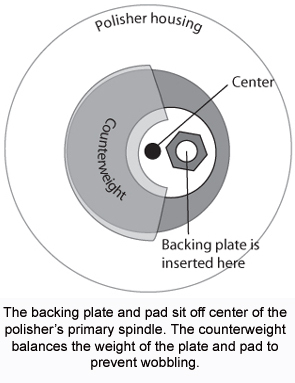 Perfect your polisher with a counterweight. The Porter Cable 7424XP Dual Action Polisher is designed to move both in an orbital motion and a jiggling motion. With all that movement, the polisher may become unbalanced and the user has to compensate for the added wobbling. This problem is easily corrected with a counterweight. A counterweight is included with your Porter Cable 7424XP. This is a replacement counterweight. The counterweight fits on the eccentric housing, located just above the backing plate. This is the part that causes the plate to orbit. The semi-circular weight orbits with your backing plate to balance out any irregular motion and make the Porter Cable operate more smoothly. With the addition of a counterweight, your Porter Cable 7424XP will work like a charm and render a perfectly uniform finish every time. The counterweight is for use with a 6” backing plate only. I have used the polisher for a while and it would always vibrate excessively at around 6. Checked the counter weight that came with it, and it was for a 5 inch pad. Ordered the one for a 6 inch pad, and it cut down on the vibration a lot. Can use the polisher switch on 5 and 6 one handed, very little vibration. ProsCheap price and it got here quick. If you are going to be using large pads with the 7424, a larger counterweight should be used to smooth out any vibrations and allow the machine to work at its fullest potential. if you are not using this counterwieght you are missing out. once you try it the change will be night and day. reduced vibration will make your use of your polisher more effective with less fatigue on your hands and forearms. the weight also creates less stress on your machine..... it's a win win !